Synastry is the art of comparing birthcharts of two people in a relationship. This is done by taking the positions of planets in one chart and looking at the angular aspects that they make with the planets in the second chart. Generally speaking the more close aspects there are between the major points in each chart the more powerful the attraction between them and the more intense the relationship. With strong contacts, it’s as if the two people are karmically bound together as soul mates and have to spend time together in order to experience the things that they need as individuals in this life. The Sun and Moon are polar opposites but together they form the archetype of relationship. A classic aspect for a married couple has always been the Moon of the man being in strong aspect to the Sun of the woman. The man’s Moon would see the woman’s Sun as being perfect to fulfil his needs. The woman’s Sun would feel the man’s Moon would naturally protect and support her. 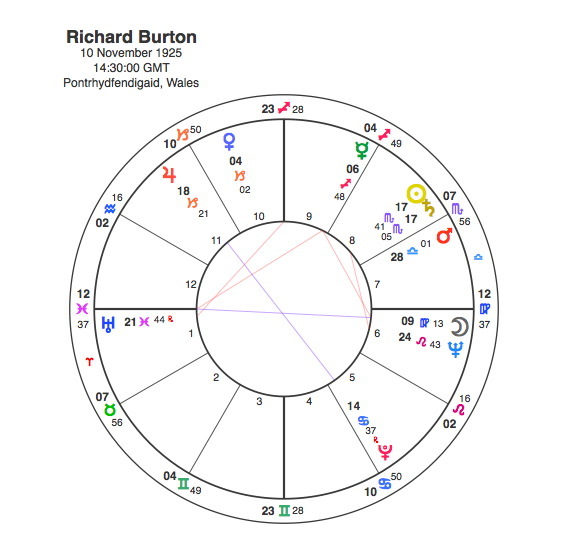 Richard Burton and Elizabeth Taylor have this combination in two ways, her Moon is conjunct his Sun and his Moon is opposite her Sun. This is an unusually powerful combination and it goes a large part of the way to describing the passion and intensity of their relationship. Elizabeth Taylor was an English – American actress, whose career began aged nine and included 2 Oscars. At one time she was called the greatest ever movie star and the world’s most beautiful woman. She married 8 times including twice to Richard Burton. Burton was a Welsh Shakespearean actor considered by some to be Olivier’s natural successor. He was Oscar nominated 7 times although never won one. He married 5 times. They were among the greatest actors of their generation, they were also very good at falling in and out of love. The film version of a love affair is always that of a great, intense passion where both people completely lose themselves in the other person but naturally such intensity is hard to sustain for ever. The sign associated with great intense passion is definitely Scorpio and losing the sense of the individual self has to be Pisces. Anyone with a combination of both would be frequently falling deeply and passionately in love. Burton has the Sun in Scorpio, Taylor has the Moon there and they are only 2 degrees apart. Taylor has the Sun in Pisces, Burton has his Ascendant in that sign and his Moon is in Virgo opposite Taylor’s Sun. Both their Ascendants are in square aspect to each other. 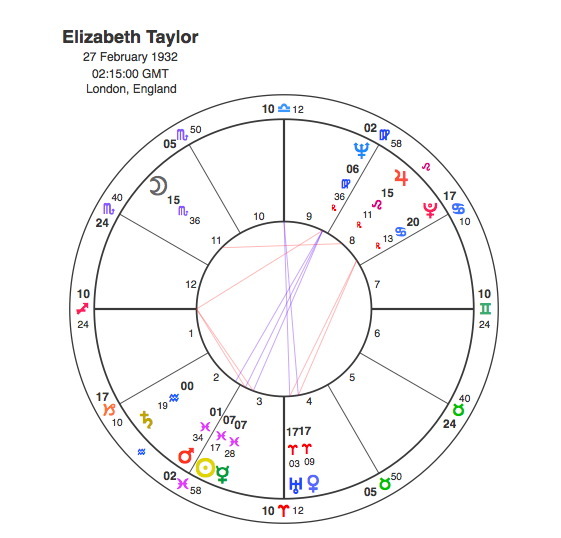 If we include trines and sextile aspects Elizabeth Taylor and Richard Burton have 8 contacts between their Suns, Moons and Ascendants out of a possible 9. Capricorn Research has never seen a couple with more, indeed 2 or 3 is the norm for married couples. The intensity of their life together is well documented, they were the epitome of the Hollywood stars of the 60s. The couple’s turbulent relationship was rarely out of the news and they were always spending vast amounts of money on fine jewellery, jetting off to exotic locations and consuming copious amounts of alcohol. Not that they were the first Hollywood couple to live like this but the media interest in them was probably greater than any before. They both had aspects between the Sun and Neptune, Taylor an exact opposition and Burton a square. Neptune would account for their roles as fantasy figures for a generation, and it would also contribute to the powerful focus on alcohol and addiction that Burton felt ended their marriage and also was probably the major cause of his ill health and death at the age of 58. They also appeared in many films together. In 1960, Taylor became the highest-paid actress up to that time receiving $7 million for Cleopatra with Burton as Antony. Her second Oscar, for her performance in Who’s Afraid of Virginia Woolf? ,was a turning point for both Taylor and Burton, as it was the “most exciting and daunting project either of them had ever contemplated”. Taylor and Burton appeared together in six other films during the decade and by 1967 their films had earned $200 million at the box office. When Taylor and Burton considered not working for three months, the possibility caused alarm in Hollywood as “nearly half of the U.S. film industry’s income” came from movies starring one or both of them. What would be the trigger to start this relationship, the powerful intoxicating contact that caused both to fall deeply for each other. It would have to be our friend Pluto making its only major aspect of Burton’s lifetime. The met in 1960, on the set of Cleopatra which was entirely appropriate as they were playing the parts of one of the most powerful love stories in history. Their affair received much attention from the tabloid press and was denounced by the Vatican as both were married to other spouses at the time. They married in 1964. Pluto was in Virgo opposite Taylor’s Sun and conjunct her Neptune from 1960 – 62 and square her Ascendant from 62-63. It was conjunct Burton’s Moon from 1961-3 and opposite his Ascendant from 62-64. Not only was this by far the most significant astrological transit of both their lives it was also the classic man’s Moon / woman’s Sun combination. Pure synastry indeed.